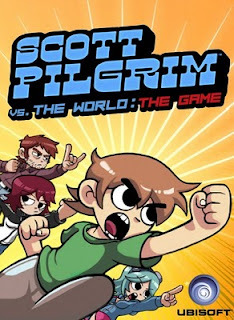 From my narrow perspective, the theatrical release of Scott Pilgrim vs. the World seemed to be a momentous occasion for both comic book fans and video game lovers. Any person who enjoyed the graphic novels could appreciate the film for its faithfulness to the source material, and anyone who’s ever held a gamepad could be pleased by the reverence it paid to the shared cultural experiences of those of us who grew up playing video games. And if by chance you fall into neither of these two groups (which begs me to question why you might be reading this blog), at least this collision of worlds came complete with some special effects and a fair bit of action. 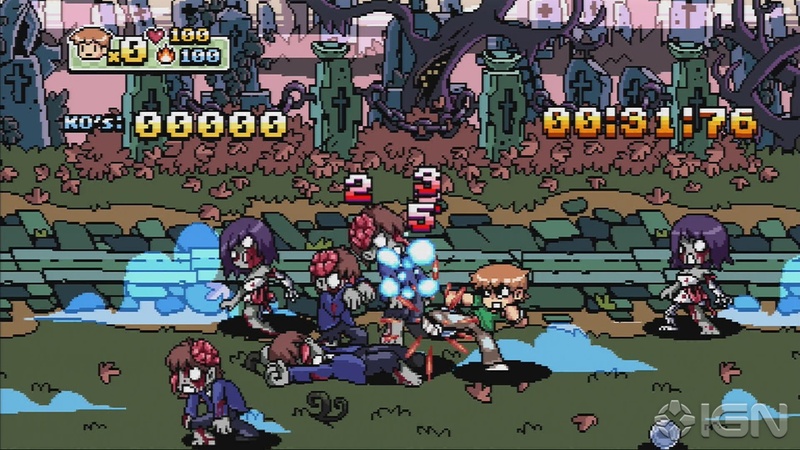 Alongside the movie, Ubisoft quietly released Scott Pilgrim vs. the World: The Game for download on the PlayStation Network and the Xbox Live Arcade. Behind it’s perhaps needlessly long title lies a side-scrolling beat-em-up that was obviously lovingly crafted to evoke the arcade games that I loved when I was a kid, while still making use of the fidelity allowed for by the current generation of hardware. While the mechanics of the game aren’t terribly surprising, much of this game bears a unique charm that seems to be specifically targeted at people like me. Ubisoft somehow managed to create a game that is paradoxically both modern and nostalgic. 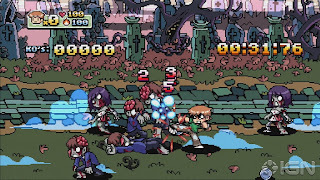 Take for instance the artistic direction of the game: it is highly reminiscent of the sort of pixel art that would have been present during the 16-bit era (think Super Nintendo), yet the complexity of each sprite as well as the sheer number of moving parts on the screen at any given time would not have been possible on older home consoles. On top of that, there is the clever inclusion of a soundtrack provided by a “chiptune punk band” (quoted from wikipedia) called Anamanaguchi. However, a trained ear will notice that the music isn’t relegated to low-bit synthesizers. The band employs some much appreciated guitar, bass, and drums to fill out the sound and protect the ears from the would-be irritation of prolonged exposure to Nintendo-core. This trifecta of modern retro goodness is completed with the substitution of an eclectic mix of characters for the generic goons present in the beat-em-ups of old. 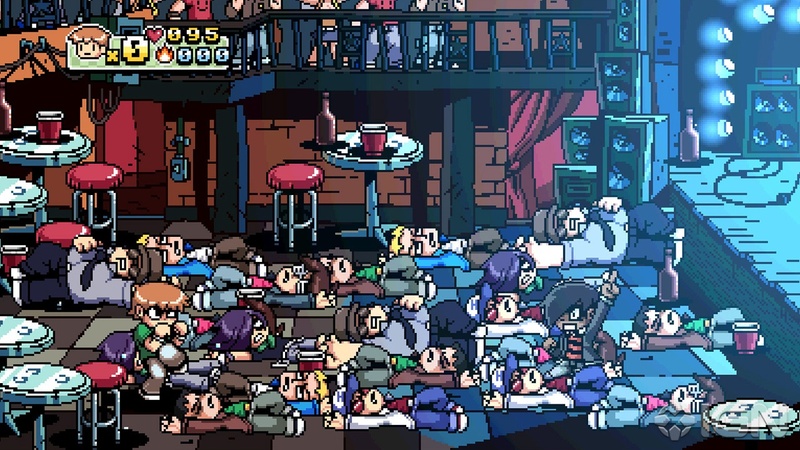 Instead of repeatedly punching pallet-swapped variations of the same outrageously dressed street thug, I found myself having to (or perhaps being granted the privilege to) pummel dude-bros, hipsters, punks, and emo kids. Yes, I was still pressing the same few buttons over and over and over again, but the inclusion of culturally relevant stereotypes adds to the tongue in cheek nature of the game. Going into Scott Pilgrim vs. the World: The Game, I anticipated most the aforementioned parts of the game. What I really didn’t expect was how difficult the game proved to be. It took some effort to grind for levels—yep, there are some light RPG elements in the game—in order to bring my character up to speed before taking on each stage, and even then I found the game to be pretty difficult on the easiest difficulty setting. As do most games that require a little skill, this one kicked my but on several occasions. It was just like begging mom for a couple of quarters so that I could play the Teenage Mutant Ninja Turtles game at the Pizza Hut… minus the part where she says “no”.